On the base of mathematical modelling, with the use of the Mathcad Calculation Server technology the examples of investigations of some cycles of gas and gas-steam turbine power plant are given in the work. It is shown, that, on the whole, except for existent methods (increasing gas turbine inlet temperature, optimization of steam turbine inlet parameters, using multipressure steam generators, etc. ), the complication of gas and gas-steam combined cycles, namely intermediate compression with intercooling of cyclic air and reheat in gas turbine cycle, allows to increase their efficiency. Keywords: information technologies, Mathcad Calculation Server, gas and gas-steam combined power plants, efficiency. Prospect direction in power plants development is related with gas-turbine (GTP) and gas-steam turbine (GSTP) power plants [1 - 3]. In general, ways of efficiency increase of GTPs GSTPs have not been studied completely. This is a complex, multi-parameter problem which in many cases can be solved by means of mathematical simulation. Due to wide use of mathematical packages, such as Mathcad, Matlab, Mathematica, Maple, and others, which came to take place of programming languages, engineers specializing in thermal power engineering can solve problems in a quick and efficient manner without the need to resort to the aid of third-party programmers. The first place in the list of the most important “IT-revolutions” belongs to development of so-called “cloud computing” – providing of remote computing ability, footprint (“clouds”) and communication channels for customers. The reason which begets using of “cloud computing” is high cost for program licenses for detached workstations, rent of space, electricity and control of software piracy. By “clouds” we mean computing centers which are significantly more powerful than user’s stationary infrastructure. Instead of physical servers customers use virtual servers which are spread in allocated net of computers with industrial ability. Investigations and analysis of cycles of GTP and GSTP are given partially in works [1, 2, 3, 4, etc.]. But at the same time, in our opinion, such power plants should be additionally studied. For example, in , when investigating exemplary GTP and GSTP cycles some simplifications have been done: multi-stage air compression and multi-stage heat addition in gas turbine cycle were changed into isothermal processes which can not be realized in real gas turbine power plant. In addition, in , gas turbine (GT) cooling was not taken into account, which is obligatory to protect the hot turbine components from excessive thermal stresses. In  cases of optimization of parameters of steam turbine as a component part of GSTP were mainly considered. At the same time optimization of parameters of GTP as a component of GSTP in the given work were not practically studied. In addition, in  schemes of GSTP were investigated at today’s level of development and possibilities of power mechanical engineering. Possibilities of GSTP development in future due to cycles complication of such units are not analyzed enough in . Specialists of Moscow Power Engineering Institute (Technical University) with participation of research workers of other organizations have created a website located at www.vpu.ru/mas which can be useful for all who need to determine properties of working fluids or heat carriers and mathematical simulations or visualization of processes in power engineering . Results of investigations and analysis of different schemes of GTPs and GSTPs can be found in specialized literature. But such sources are not always easily accessible and they often give only partial information. Therefore the given paper provides information regarding investigation and analysis of some schemes of gas-steam combined cycles via the website http://twt.mpei.ru/ochkov/VPU_Book_New/mas/index.html in an interactive mode with the purpose of optimization of such power units. Figure 1 shows the page of the website http://twt.mpei.ru/ochkov/VPU_Book_New/mas/index.html where a user can see a list of types of power units which can be numerically investigated in an interactive mode. Theoretical investigations of influence of multi-stage air compression and multi-stage heat addition in GTP and GSTP cycles on the efficiency of GTP and GSTP are presented in . Using these results numerical simulation will be provided in this paper. According to  a high efficiency of gas-steam combined cycles can be theoretically received if reheat and intercooling is applied. An example of input data block which is prepared according to the technology of Mathcad Calculation Server – technology which allows to post Mathcad worksheets in Internet so that a user can fill in interactive math calculation forms without having to know or own Mathcad – is shown in Figure 2. 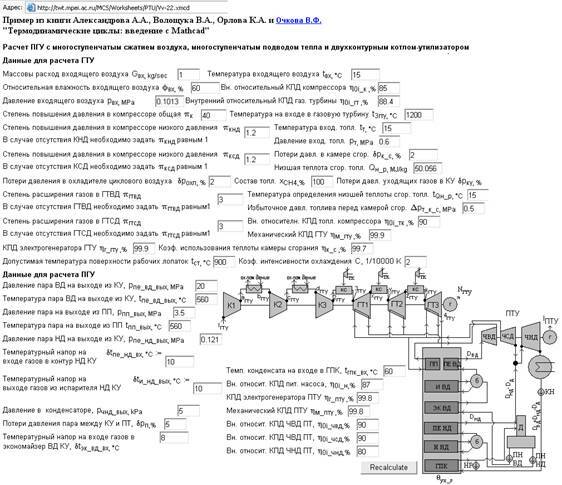 Therefore, a user of the site http://twt.mpei.ru/ochkov/VPU_Book_New/mas/index.html chooses required source from the list (Binary cycles), fills in input data which are located in special “live” cells, presses button “Recalculate” and receives calculated data about characteristics of the chosen thermodynamic cycle. In the given paper, for an example, there were made calculations for schemes of GSTP in which gas turbine inlet temperature was 1200 oC. In a case of GSTP with multi-stage air compression there were three compressors: respectively low-pressure compressor (LPC), middle-pressure compressor (MPC), high-pressure compressor (HPC). In a case of GSTP with multi-stage heat addition there were two or three gas turbines: respectively high-pressure turbine (HPT) middle-pressure turbine (MPT) and low-pressure turbine (LPT). In the figure 3 results of numerical simulation of the chosen schemes of GSTP plants are shown. So, first of all, lines in figure 3 which correspond to single-pressure HRSG are limited to some values of general compression ratio. That is conditioned by the technological requirements for GSTPs. 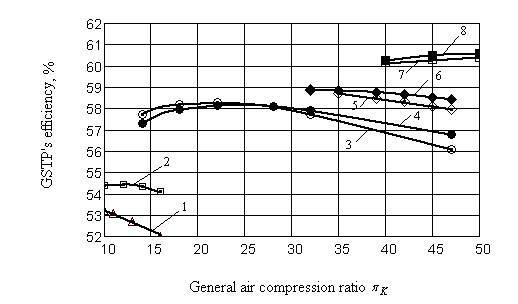 The extreme left points of these lines correspond to the minimum value of compression ratio for which the exhaust gases temperature after HRSG has the minimum value – 70 oC (for the line 3 in the figure 3 that corresponds to compression ratio of ). The extreme right points of these lines correspond to the maximum value of compression ratio for which temperature difference between inlet exhaust gases and outlet superheat steam is decreased to 20 oC (for the line 3 in the figure 3 that corresponds to compression ratio of ). Moreover, in the figure 3 it is shown that for some values of general compression ratio lines for double-pressure HRSG are absent – there is no reason to use it. On the other hand, lines for single-pressure HRSG for these values of general compression ratio are presented. For GSTP which consists of GTP with one-stage air compression and two-stage heat addition (line 5 in the figure 3) using double-pressure HRSG is not reasonable when values of general compression ratio are from 15 to 30 because single-pressure HRSG can completely utilize the heat of exhaust gases (in the figure 4 thermal diagram of such HRSG is shown with continues lines). That takes place because when decreasing exhaust gases temperature after GTP is increased and for , according to heat and mass balances of HRSG, steam generation is high enough for single-pressure HRSG to utilize the heat of exhaust gases. 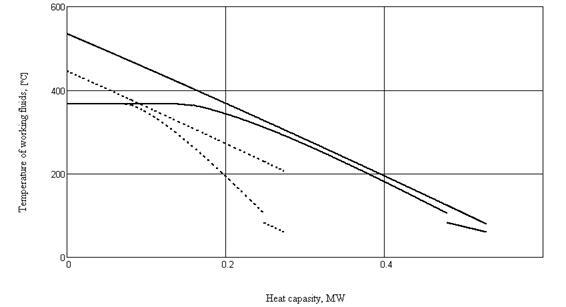 It should be noted that according investigations presented in , maximum values of efficiency of GSTP with multi-stage air compression, heat addition and single-pressure HRSG (lines 3, 4, 7 and 8 in figure 3) corresponded to cases when transition of minimum temperature difference between gases and water from one end of economizer to another takes place. For example, for schemes which correspond to lines 3 and 4, when , minimum temperature difference in HRSG takes place at cold side of economizer (in the figure 4 the thermal diagram of such HRSG is shown with continues lines). When , minimum temperature difference in HRSG passes to hot side of economizer. In the second case it is reasonable to use double-pressure HRSG (in the figure 4 the thermal diagram of such HRSG is shown with stroke lines). The figure 3 shows that, in general, multi-stage air compression and multi-stage heat addition in HRSG can increase efficiency of such plant. For example, using two-stage heat addition gives 5 % increase of HRSG’s efficiency in comparison with one-stage heat addition (lines 1, 3 and 4 in the figure 3). Using three-stage heat addition gives another 3 % growth of HRSG’s efficiency in comparison with two-stage heat addition schemes (lines 3, 4, 7, 8 in figure 3). But it should be noted that schemes of GSTP with three-stage heat addition can theoretically exist at high compression ratio ( ). GTP plants with are installed nowadays. But GTP plants with are not possible at present level of power mechanical engineering. It is also shown in the figure 3 that using multi-stage air compression for decreasing compression work is not an effective way for efficiency improving of GSTP units analyzed in the paper. 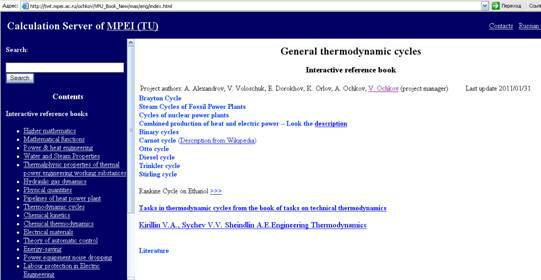 Using a mathematical package Mathcad for which a network publisher is Mathcad Calculation Server allowed to create a website http://twt.mpei.ru/ochkov/VPU_Book_New/mas/index.html that made possible to do interactively calculations of thermodynamics cycles of thermal power installation. Numerical simulation of thermodynamics cycles of some schemes of GSTP made via the website showed that besides ways which are often used nowadays efficiency growth can also be reached by using multi-stage heat addition. Using multi-stage air compression for decreasing compression work is not an effective way for efficiency improving of GSTP units analyzed in the paper. Almost all possible ways of improving efficiency need to increase the value of air compression. The website http://twt.mpei.ru/ochkov/VPU_Book_New/mas/index.html is open for different purposes, which may include it being analyzed and criticized, corrected for removing assumptions, extended for a wider range of application, etc. S. V. Tsanev and others. Gas Turbine and Gas-Steam Turbine Power Units of Thermal Power Plants // M.: Publishing House of MEI, 2006, 584 pp. A. Andryushchenko. The Thermodynamic Efficiency of Complex Cycles of Gas-Turbine Units in Combined-Cycle Installations // Thermal engineering, 1998, Vol. 45, No. 3, pp. 68 – 71. Kehlhofer, R., Combined-Cycle Gas & Steam Turbine Power Plants, The Fairmont Press, Lilburn, Georgia, 1991. Gas Turbine World 1997 Handbook, Pequot Publishing, Fairfield, CT, USA, 1997. V. F. OCHKOV, A. A. Aleksandrov, V. A. and others. Caclulations of Thermodynamic Cycles via Internet // Thermal engineering, 2009, Vol. 56, No. 1, pp. 86 – 89. V. A. Voloshchuk. Thermodynamic optimization of exemplary cycles of some schemes of gas and Gas-Steam Turbine Power Plants // Vestnyk of NTU “HPI”, 2011, No. 6, pp. 77 – 87.